In 2016, the U.S. Environmental Protection Agency (EPA) Region 10’s Office of Environmental Review and Assessment (OERA) and the Washington State Department of Ecology (Ecology) conducted water sampling and field analysis at 10 federal and state fish hatcheries in Washington and in Idaho. The objective was to provide data on the concentrations of formaldehyde being discharged from hatcheries after applications of formalin, which is used by the hatcheries to control external parasites on hatchery fish and their eggs. Formalin is a generic term that describes a solution of 37% formaldehyde gas dissolved in water. The Food and Drug Administration (FDA) requires a 10-fold dilution of finfish treatment water and a 100-fold dilution of finfish egg treatment water, which should lead to a discharge concentration of no more than 25 parts per million (ppm), equivalent to 25 μL/L formalin, or 10 ppm formaldehyde (active ingredient). According to the FDA, additional instream dilution, infrequent use, and rapid degradation should render the discharged formalin below a level that causes significant environmental effects on aquatic animals. In a recent risk assessment of hatcheries covered by the EPA National Pollutant Discharge Elimination System (NPDES) General Permit for Federal Aquaculture Facilities and Aquaculture Facilities in Indian Country within Washington State, EPA Region 10 concluded that formalin use at hatcheries covered that NPDES General Permit is not likely to affect salmonids listed under the Endangered Species Act (ESA) in concentrations below 10 ppm formaldehyde in the receiving water. Therefore, the EPA has used 10 ppm formaldehyde as the level of concern for this study, against which formaldehyde concentrations detected in samples were compared. The EPA and Ecology worked with staff and managers at U.S. Fish and Wildlife Service and Washington State Department of Fish and Wildlife to identify which hatcheries in the Northwest use the most formalin, and to ensure that sampling included a range of formalin use scenarios (i.e., egg, juvenile, and adult treatments). 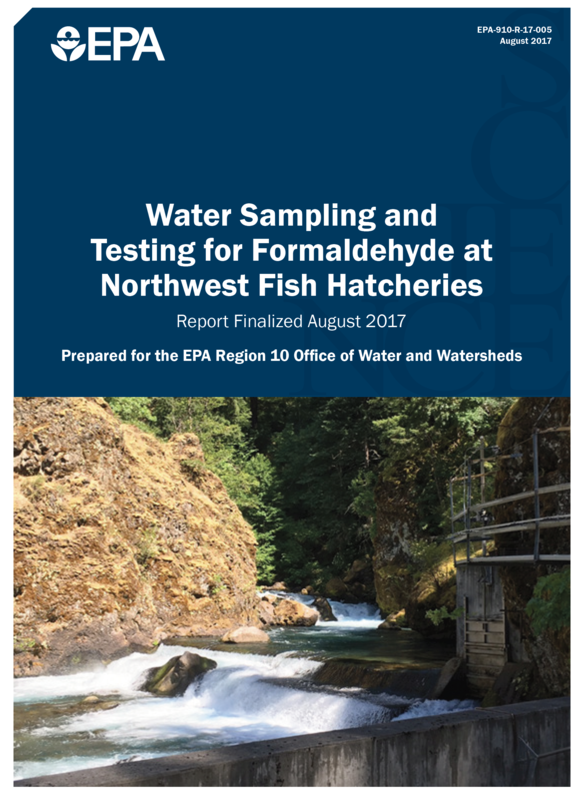 By sampling formaldehyde in the effluent at facilities that use the most formalin across Washington and Idaho, and by sampling during peak formalin use, this study intended to capture a reasonable worst-case scenario for estimating formaldehyde concentrations in Pacific Northwest hatchery effluent. Sampling was performed in accordance with an approved quality assurance project plan (QAPP) at a minimum of three locations per fish hatchery: 1) the influent raw water; 2) the effluent water; and 3) the receiving water. Samples from facility outfalls where treated effluent would be discharged were collected as both grab samples collected by hand and discrete interval samples collected with an automated sampler. Grab samples were collected after at a period when it was believed that the plume with the highest likely concentration of formaldehyde was being discharged through the outfall. The analytical parameters for influent raw water and effluent, are applicable field measurements (temperature, total chlorine, ammonia, dissolved oxygen, conductivity, turbidity, pH, and formaldehyde screening) and laboratory analysis for formaldehyde. The EPA Region 10 Laboratory performed all of the analytical chemistry required for this study. In all of the hatcheries sampled for this study, the maximum concentration of formaldehyde measured did not exceed the FDA and EPA Region 10 level of concern of 10 ppm. Based on data collected at the hatcheries that participated in this study, as well as the available toxicological data for threatened and endangered salmonids and an EPA risk assessment for formalin in Washington hatcheries, the EPA believes that current levels of formalin use are generally protective of aquatic life and ESA listed salmonids in Pacific Northwest waters.